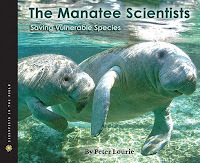 The Manatee Scientists by Peter Lourie. Grades 4-7. Houghton Mifflin Harcourt, March 2011. 80 pages. Review copy provided by publisher. This latest entry in the Scientists in the Field series examines manatees and the scientists who study them in the hopes of saving them from endangerment and extinction. You know about manatees in Florida, but did you know that there are two additional manatee species, one in the Amazon and one in West Africa? While the Florida manatees are relatively easy to spot and study, the other species, living in murky waters, are much harder to find. But it's important to study all of the manatee species to see what we can do to keep them from becoming extinct. Bright, colorful photos add appeal to this well-researched book. Most photographs depict the Florida manatees, ostensibly because it's much easier to get good shots of these clear-water mammals. Back matter includes manatee facts (on all three species), a glossary, an index, and an author's note. I mean, you know what you're getting with the Scientists in the Field series and I'd go so far as to say that this is a must-have series for your library shelves. They're well-researched books on interesting topics and give kids a glimpse inside the jobs of many different scientists. That said, this isn't one of my favorite entries in the series. It's fine and the subject will definitely be popular, but I don't know that it stands out when compared to some of the other books in the series. The format is standard, the writing's okay, the photos are bright and appealing. Hand this to your aspiring marine biologists or skip it and hand them Shark Life by Peter Benchley instead. Happy Nonfiction Monday! Check out this week's roundup at Chapter Book of the Day!